That's Jennie on the far left with a group of Team In Training alumni in Savannah. Did you feel the earth move and shake last November as Savannah hosted its inaugural Rock ‘n Roll marathon? As 23,000 people ran through the brick-lined streets of a town filled with “hey y’all” and laissez faire attitude, a sea of purple could be seen in the masses: all the people who were running the race for Team In Training. What one couldn’t see, though, is an important person who was handling everything behind the scenes for the Savannah team. Her name is Jennie Brewster (and yes, she’s just as spunky and great as her name sounds), and without her, the Savannah team would’ve been lost amongst the sea of runners. From waking up early for group runs just to greet everyone at the finish line to hosting social events in her own home, Jennie was the parent who held the team together. She was always so involved with the team, everyone was shocked to learn she had never completed a TNT event herself. “Funny thing, everyone thinks that because I work for TNT, I’ve done plenty of marathons. I have completed some sprint triathlons, 5K and 10K races on my own but the truth is, I’ve never done a TNT event! While I do train with the team throughout the season, my focus is on getting everyone else to the finish line. If I were focused on getting myself there, I wouldn’t be able to give my full attention to our Team in Training participants,” she explained. Despite focusing her efforts on the team and not training for the races herself, Jennie still has loved ones whom she “runs” to honor. “There are so many people in my life who have been touched by cancer, the list is too long. Collin J. Huggins will always hold a special place in my heart. Collin lost his battle with ALL at the age of six in 2003. He loved Spiderman, had an adorable country accent, learned to read and lived to see his baby brother be born. He touched more people than his parents will ever know”. Her dedication to loved ones, positive attitude and refreshing spirit are what got everyone to the finish line that day in November. Having her in their corner and knowing she would be waiting at the TNT tent with hugs (and water) helped everyone complete their event and come together as a family at the end. Without her, the Savannah team would not have been the same nor would we have come together as such a family. Brandy Mai ran her first half marathon with Team In Training for the inaugural Rock ‘n Roll Savannah event last year. She runs in memory of her dear friend, James Hall, and in honor of her cousin, Gunner Murphy. Final Exams. Term papers. Group projects - The seemingly never-ending cycle of life as a college student. As a student at Georgia Tech, Todd Schmidt spent countless hours in the library, focusing on his schoolwork and preparing for his future as an aerospace engineer. Even though his life was incredibly stressful between school and his commitment to his fraternity, he knew that there was just one more little thing to add to his to-do list: cure cancer. ﻿I know what you’re thinking. How can a college student with no medical or scientific background cure cancer? It’s simple! By creating a team and raising awareness and funds for The Leukemia & Lymphoma Society. After returning from a fraternity convention that focused a lot on philanthropy, Todd realized that even though he was busy with a rigorous course load at Georgia Tech, he wanted to use whatever free time he had to serve. He remembered how his parents participated in Team In Training (TNT) while he was in high school. At almost the same time, a close friend of his was diagnosed with Acute Lymphocytic Leukemia (ALL). It just clicked. Todd decided to join TNT. Todd convinced his friend, Justin Levine, to join his team. He figured that if he wanted to do it, there were plenty of other people that would want to help, too. 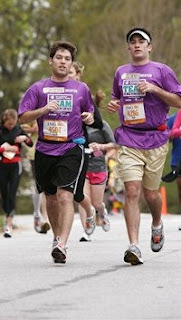 Justin (left) and Todd (right) running in the 2009 ING marathon. Unlike Todd, Justin didn’t have a mission connection. He admits to initially joining the team simply because he had always wanted to run a marathon. Together, Todd and Justin recruited six other Tech students. It was important for them to find an event that was close to home, so they decided on running the now Publix Georgia Marathon and Half, held right here in Atlanta. In their first year with TNT, the Tech team raised more than $19,000. Todd and Justin were the backbone of the Tech TNT team. They started formally recruiting in 2009 and had 25 team members. Todd and Justin went the extra mile (pun intended) and, in 2011, made the team an official student club at Georgia Tech. With this new status, the team now has a faculty advisor (who is also a TNT alum) and student board members, ensuring future leadership of the team as people graduate. But even more importantly, the team is now eligible to receive funding from student government. This financial support helps to plan and promote team fundraising events and limits the amount of raised funds needed to implement each fundraiser, ultimately allowing the team to raise more money toward the fight against blood cancer. To help keep the team engaged and interested, they set up group runs throughout Tech’s campus. They also organized shuttles to join the official TNT training runs. As college students, time management was important – these runs on campus helped to keep the team active and engaged, all in between classes, exams and projects. Todd and Justin were able to manage the time the team needed to train for the races but also ensure that academic endeavors were not affected. Together, Todd and Justin helped increase participation year after year. This year is the team's fifth year participating in TNT, and with the help of Alyssa Golemme, the team's current captain, the Tech Team had 133 students sign up and raised approximately $136,781! Although Todd and Justin have since graduated and are no longer officially part of the team, they are still actively involved. In fact, they are both taking time off from their jobs (Justin is in New York City and Todd is in Michigan) and traveling to Atlanta specifically to cheer on the Tech Team at the Publix Georgia Marathon and Half this weekend. Jen Lesshafft is the Alumni Relations Coordinator at Life University in Marietta, Ga. She has been an avid supporter of The Leukemia & Lymphoma Society since 2008 when her then 18-month-old nephew was diagnosed with leukemia. As a way to help and give back, Jen interned with The Leukemia & Lymphoma Society of Northern Florida while studying at the University of North Florida in Jacksonville. 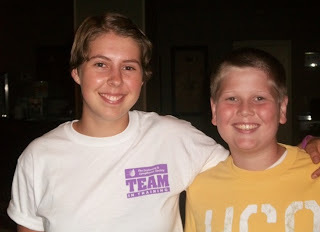 Each year since her nephew’s diagnosis, she and her husband, Chris, have raised funds and participated in Light the Night Walks in Atlanta, Jacksonville and Daytona Beach. She now serves on TNT Georgia Chapter’s Social Media & PR Committee. Although I have been in school for almost fifteen years, my time with Team In Training was one of the best learning experiences I have ever had. I am a high school senior from Atlanta, GA, and at this time last year I joined the Team as a school project. Despite reading numerious enthusiastic accounts of people's experienes with the program, I started with the mindset of obligation rather than opportunity. I thought I was prepared to take on the challenge of training for and competing in a triathlon, but needless to say, I still hit the ground running... figuratively and literally. I am sure that my five-month Team In Training experience taught me lessons on many levels, some that I probably have yet to realize. Physically I was educated in form, fitness, technique, and nutrition. Mentally I learned what it means to persevere, focus, motivate, and be motivated. However, I also learned in another way. I am sure that anyone who has participated in a TNT event can vouch for the fact that there is emotional growth in the involvement with the program. I not only gained an incredible respect for the patients, families, researchers, fundraisers, and fighters of cancer, but I was able to develop a personal connection to the cause. As a teenager, pondering my life and future, this experience gave me a new way of looking at myself and the world. It was more than just completing a tremendous project. The support and enthusiasm of my teammates, coaches, friends, family, and donors helped my raise my head and look out on the endless opportunities that are out there. I now realize how fragile life is and that we have an obligation to make each day count for ourselves and better for those around us. Evelyn Keeney-Ritchie completed the Tri Latta Triathlon in the summer of 2011 and raised $2,730 for The Leukemia & Lymphoma Society. Evelyn is currently a senior at Academe of the Oaks High School and hope her story gives courage to those who think they are too old, young, or unfit to follow their dreams and change the world.